This is an example of palisade and daub construction. The ends of tree trunks and branches are buried in the ground or “earthfast.” They provide the support for walls which are finished with a covering of daub (a mixture of clay, and, straw and water). 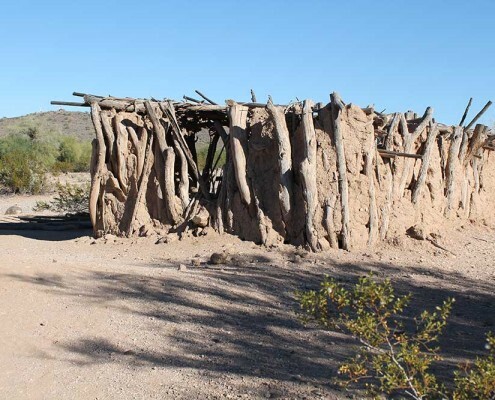 The roof is made of ocotillo, saguaro ribs, and greasewood branches also covered with daub. 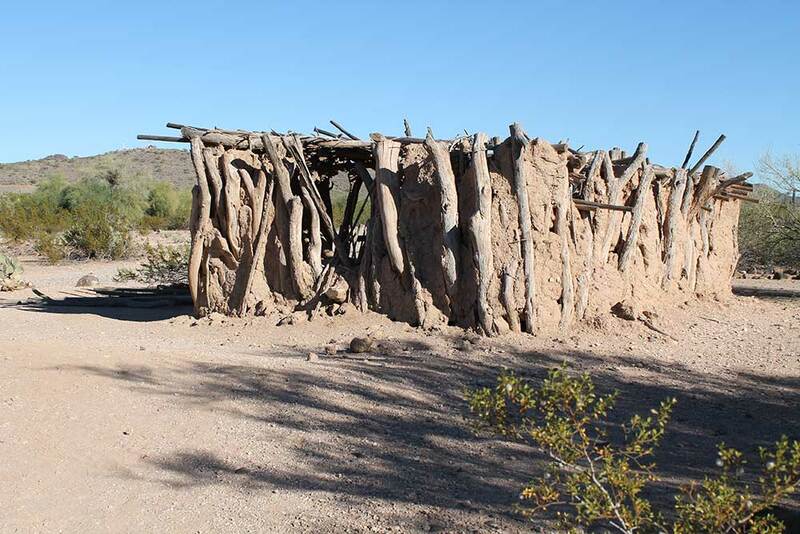 An example of one of the earliest houses built in southern Arizona by “anglos”, this primitive “picket house” circa 1858, would have housed various pistols, rifles, and knives, axes shovels, buck saw, bucket, deer hides, blankets, dishes, cooking pot, food supplies (coffee, salt, tea, flour, sugar, butter, beans, corn, pinoche and tobacco) as well as a jug of mescal and one of whiskey. The exhibit is based on the published reminisces and illustrations of Horace Chipman Grosvenor, a wood-engraver from Ohio sent out with Phocion R. Way as agents of the Santa Rita Mining Company. The two men from Ohio, Grosvenor and Way, came to promote mining near Tubac in the Santa Rita Mountains. They made woodblock carvings on what they saw and sent prints, along with ore samples, back east to raise money to develop mining. They lived in this type of house for two years. During rain, they would rather sleep outside than inside. Outside they just got wet; inside, they not only got wet, but the mud from the roof fell in on them along with scorpions. Mr. Grosvenor never returned to his wife in Ohio. He was killed, along with two teamsters, by Apaches. Mr. Way returned to the East.